Few Founding Fathers are more iconic than Benjamin Franklin. I thought I had a pretty good grasp on his life and the role he played during those revolutionary years. But if I had previously known that he had an illegitimate son that was a Loyalist governor of New Jersey I had effectively forgotten that. 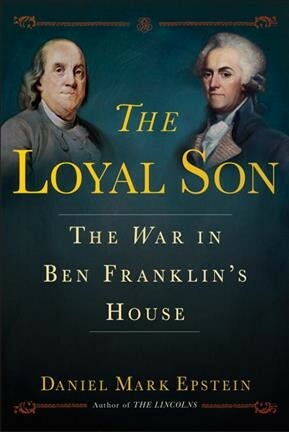 In Loyal Son, Epstein illuminates the family life of the Franklins and the unique relationship between these two fascinating men. The senior Franklin would fight for the freedom of the American Colonies from the tyranny of the English. The younger Franklin seemed equally dedicated to the English Crown and its claim over the wayward Americans. This deep division would tear the two apart despite years spent working tirelessly together to establish peace. I loved reading this book. I feel the need to call it a page turner even though I knew how everything would end. I just kept hoping the two men would find a way to resolve their conflicts. I wanted success and happiness for William while I knew his loyalties would land him on the wrong side of the conflict. Epstein is a wonderful writer and describes history with so much color and vibrance. Personalities and scenes come alive through his lovely descriptions and meticulous research. Any fan of American history or family dramas should add this to the top of their reading list.